It’s the smell you first notice, that warm, sweet, moldy smell that makes your nose wrinkle up. You begin by telling yourself that it won’t be that bad, but inside, you already know that it is. 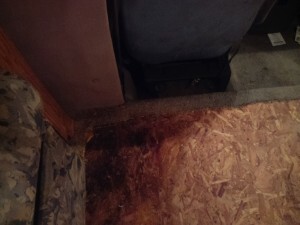 I started on the floor, one of the two small black stains in the carpet. Peeling back the carpet reveals that the floor is damaged and will need to be replaced. You hope for the best and it will only be that one small area, but again, you know deep down that simply won’t be the case. It wasn’t. The more carpet I pulled up, the more damage I discovered to the floor. 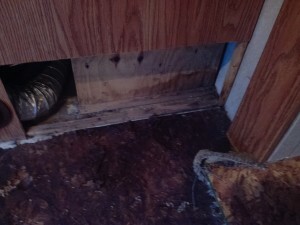 It didn’t take very long to determine the kitchen would need to be removed so the floor could be replaced under it. 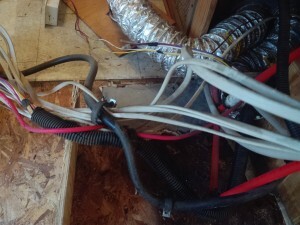 From there, the exploration led to the attic area, which also sustained heavy water damage. This area was actually the most difficult build as there was a window there that also had been leaking over time. 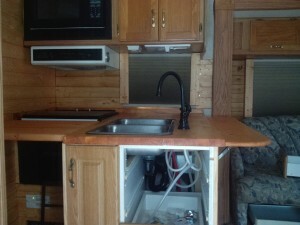 The damage was extensive and reached to the other side of the RV. The entire attic had to be disassembled and rebuilt. 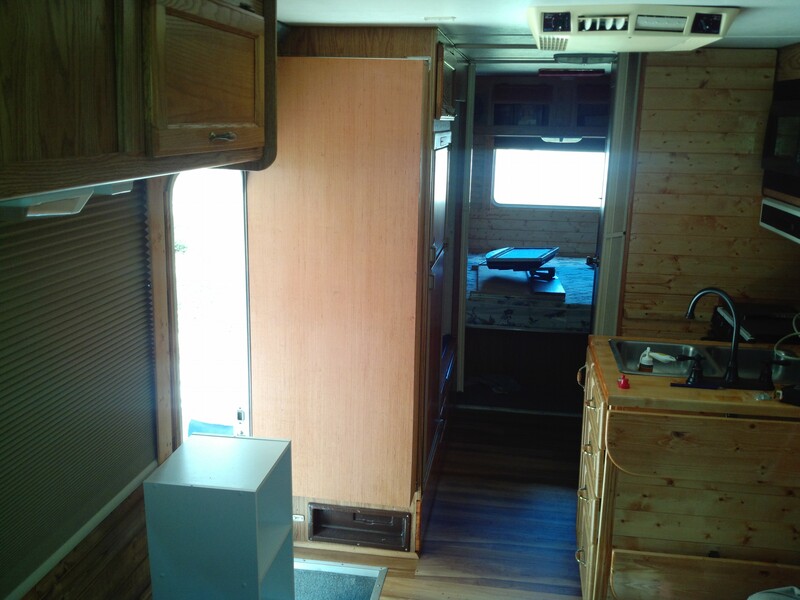 Here is the new work area/desk/storage/battery area, you can also see the new laminate flooring that we installed. 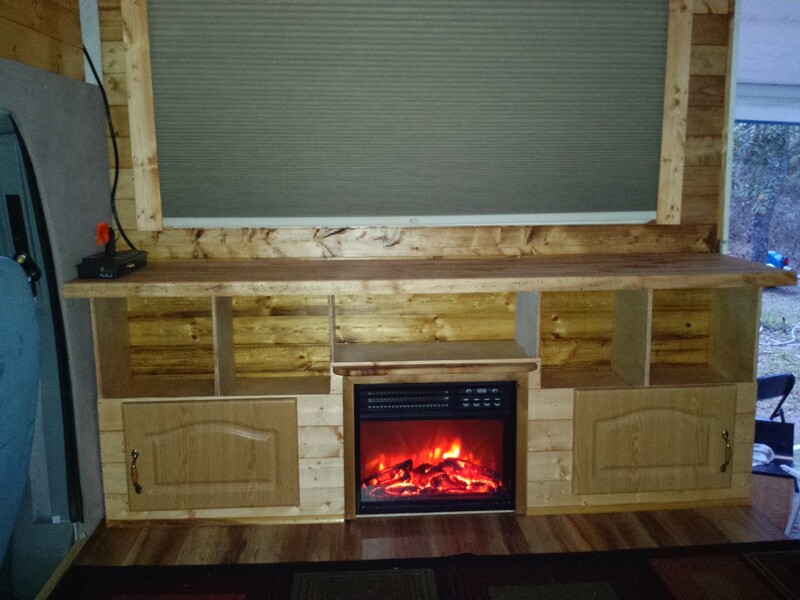 The fireplace is also a heater. The batteries are in the lower right cabinet. 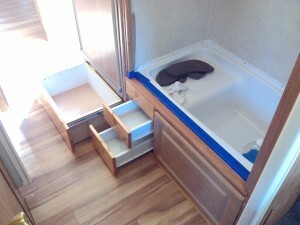 The square cubicles now have bins in them that can be pulled out like drawers. The shower pan was replaced, as was the faucet and shower head. 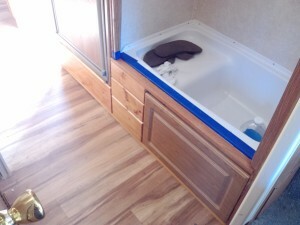 Two drawers and a cabinet were added under the shower pan. 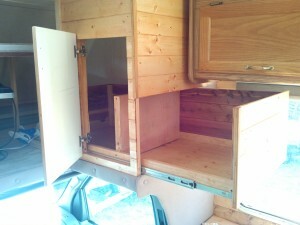 A large drawer was added under the refrigerator. 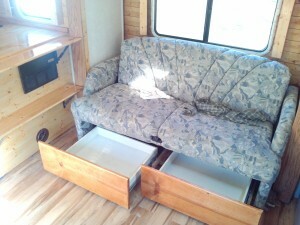 Two drawers were added under the couch. 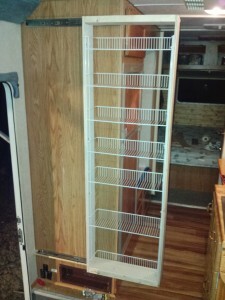 The attic was converted to a pull out closet, a large storage drawer a pull out cabinet on the other side and a large storage cabinet in the middle. 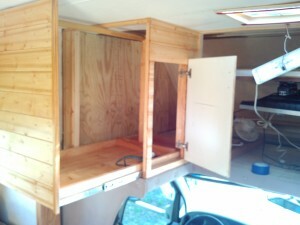 A slide out pantry was added. We also installed window treatments, room darkening by Levolor. 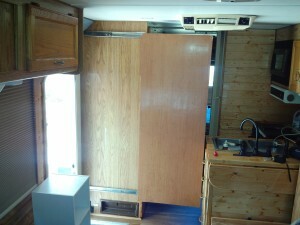 As well as valances and tinting on all the windows. 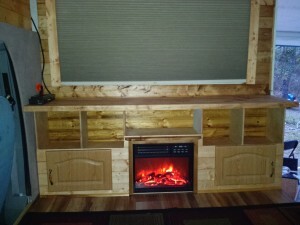 The walls were covered with pine paneling and stained and sealed. We added about 750 pounds, overall. 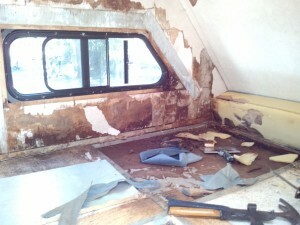 Thats about it for the actual build out of the interior bits resulting from the water damage. We did much more to get us safely on the road with a fair chance of success. these efforts will be detailed in another post.